Except for the chapter of "special occasion desserts," the recipes are about "joyful eating that happens to be healthy — unrefined, unprocessed, real food made at home," Mehmet Oz writes in the foreword. 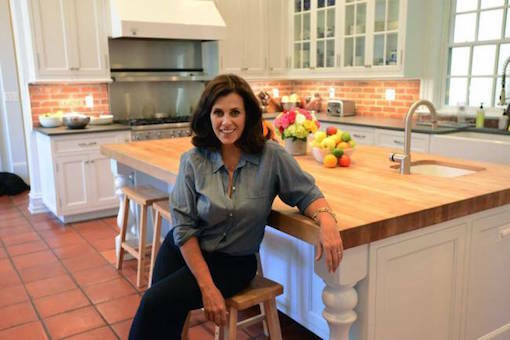 Lisa Oz has been a vegetarian since age 15, but some of her children and her husband now eat fish and some meat, too. Mehmet Oz, in particular loves bronzino, salmon and trout, and can tell when she purchases fish at the family's favorite grocery store, Cafasso's Fairway Market in Fort Lee. "It's much fresher," Lisa Oz says. "I would live at that place, I love it so much … Their produce is the best in all of Bergen County. They have a ton of organic produce." Does her husband cook, too? Lisa Oz just laughed. But he's a heart surgeon; surely his knife skills must be good? "On humans," she quipped. But she says he "loves to taste everything and he's definitely a part of the cooking process, he's just not doing the cooking himself." She says he's far from the "efficient, joyless" eater he was described as in a 2010 New York Times profile, chastely eating raw nuts and sipping green juice every hour. "In some ways, it is true because he always has nuts with him. It's not because that's his favorite food necessarily, but it's because it's incredibly portable and he's go, go, go all the time," she said. "When he does have time to eat, he's not sitting down to dinner [of] a bowl of nuts. He loves good food when he makes time to eat. It's just he's so efficient and he gets so much done that he doesn't think about taking an hour for lunch on a normal day." When they have time, the couple enjoy dining out locally — Lisa Oz said they've indulged in truffle macaroni and cheese at Pier 115 in Edgewater and pizza at Porto in North Bergen. She also likes the dal tadka and saag paneer at the Indian restaurant Kinara in Edgewater. But she says she cooks most nights, and "The Oz Family Kitchen" includes a number of her generously seasoned vegan and vegetarian recipes. Following a plant-based diet "is not really expensive, it's much cheaper if you're not buying meat substitutes." And as for the chopping and planning involved? "No one expects to just boil macaroni and serve it and pretend that was your pasta, right? So I think we just need to have a bit of a paradigm shift with the way we approach vegetables, and realize that with some seasoning, some herbs and garlic and a little olive oil, they taste amazing."